to beat him across the head for his BAD movies. 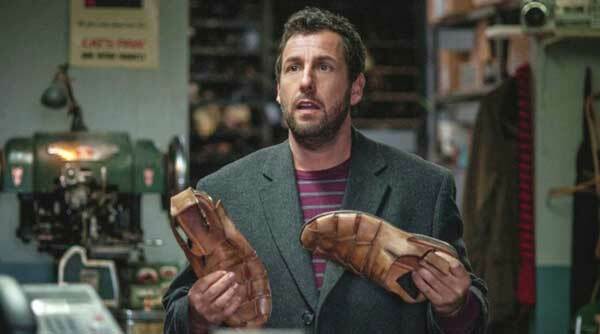 THE COBBLER is a modern day fairytale, a parable of what it might feel like “walking a mile in another man’s shoes.” If that man was Adam Sandler. Uh-oh. His regular shoe-stitching machine breaks down one night, so Max (Sandler), in desperation, is forced to finish a thug’s shoes (Method Man as Leon) on an old-fashioned spindle bequeathed to his father decades ago (by an angel? devil? phantom? ), abandoned in the basement. Max puts on the finished shoes out of curiosity – and sees Leon looking back at him in the mirror! He slips them off. He’s Max again. In these first scenes, we take it for granted that Method Man is Sandler – which is a testament to how good Method Man really is. In his thug character, he oozes gangsta, but when he is supposedly Sandler wearing Method Man’s shoes, he loses all his swagger and menace – an astonishing transformation, physically and psychologically. Seems that any client’s shoes that Max runs through the old spindle take on those magical properties – of making the wearer look like the person who owns the shoes. And that compliment to Method Man should be extended to all the actors who take on the role of Sandler-in-their-shoes. The thought doesn’t even cross our minds that they are actually other human beings who are Not Sandler! Now the movie follows that flow chart of first treating this discovery as comedic, then dangerous, and eventually arcing to Max using the machine for something charitable. Steve Buscemi is the barbershop store owner next door to Max’s shoe repair shop, who offers sage advice when Max is hardly listening. Ellen Barkin, with fakes that enter a room before she does, is a ferocious gangster boss. Melonie Diaz is a community worker, who will become Max’s love interest. Needless to say, with his newfound metamorphosis power, Max unwittingly intrudes into other people’s lives, with results that are funny (when he tracks Leon while wearing the shoes of a transvestite), quirky (when he is invited into the shower by a girl who thinks he is her boyfriend – soon realizing that he can’t take off his shoes to join her, because he would revert back to himself! ), or fatal – dabbling in Leon’s underworld business. The last time I cried during an Adam Sandler movie (not counting all the tears of pain suffered throughout his catalogue) was CLICK (2006), when the main character realized he had lost his family. 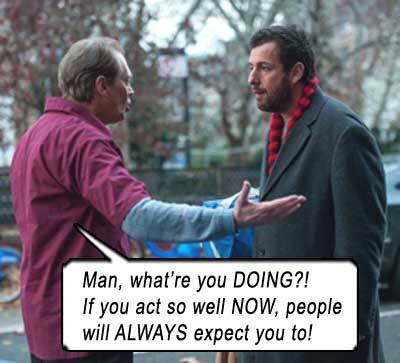 Here, Sandler once again coaxes tears of empathy when he performs his charitable deed – for family. Max’s old mother (Lynn Cohen) is lonely and forlorn without her deceased husband, so Max finds a pair of his father’s shoes and appears to her one night as his father – her husband (Dustin Hoffman in a superb cameo) – in a poignant dinner date… that nonetheless edges towards creepy as the night wears on… I mean, is mum gonna put the hard word on “dad”? THE COBBLER makes us believe in the power of storytelling again; makes us believe in the power of empathy; and makes us believe in the power of Adam Sandler. Writers: Tom McCarthy, Paul Sado. Starring: Adam Sandler, Steve Buscemi, Melonie Diaz, Method Man, Ellen Barkin, Elli Meyer, Dustin Hoffman, Allen Lewis Rickman, Donnie Keshawarz, Sondra James, Kim Cloutier, Dan Stevens, Lynn Cohen, Fritz Weaver, Kevin Breznahan.